“Now is not the end. Nor, indeed, is it the beginning of the end. But it is, perhaps the end of the beginning.” As the United Kingdom prepares to withdraw from the European Union, the words of Britain’s war-time leader, Winston Churchill have a curious resonance. It is now nine months since Britain voted, by a margin of 52% to 48% to leave the EU. Since then the economy has surprised many by growing more strongly than expected, while the debate has been dominated by what our future relations with the EU will look like. With the triggering of Article 50 yesterday, Theresa May has now formally begun the two-year process of the UK’s withdrawal from the European Union. This has prompted some renewed discussion about its likely economic implications. New research from independent think tank Demos (to which your present author contributed) highlights how a hard Brexit might play out across the UK. 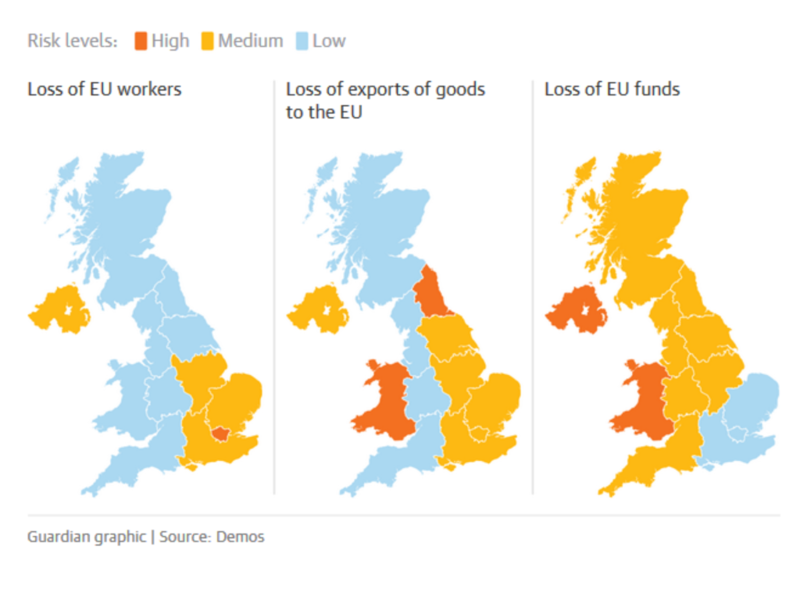 Analysing the reliance of different parts of the UK on EU labour, exports and EU grants, they find that the risk to Wales, Northern Ireland and the North East are particularly serious (see maps). Ironically, Wales and the North East voted to Leave, despite their dependence on EU funds. In their analysis of the risks to different sectors they find that manufacturing and agriculture are particularly vulnerable because of their reliance on EU labour, trade with the EU and the potential magnitude of future tariffs. They also envisage the possibility of Dublin poaching financial firms that are looking to relocate – something the FT has shown is increasingly likely. But what evidence is there on what the British people actually want? The Economist has a blog about the latest survey data on attitudes towards the various possibilities involved in soft and hard Brexit. It seems, not surprisingly, that people want to have their cake and eat it. Such survey questions do not give much, if any clue about priorities and trade-offs. More specifically, while 90% of voters (whether Leave or Remain) favour free trade, a clear majority of both also favour customs-checks on goods and people from the EU – the antithesis of free trade. And while people support some EU regulations – on beach cleanliness and roaming charges – they dislike others e.g. on the use of pesticides by farmers. One thing we can be sure about is that a lot of people are not going to get what they want. The EU is not perfect. Its policies on agriculture and fisheries are often wasteful and inefficient. Some of its regulations are unnecessary and onerous. The creation of the euro may not have been in the best interests of all its member states. But, over the course of sixty years, by creating the conditions for the peaceful co-existence of nations and a gradual liberalisation of markets, it has probably done more than any other institution to promote openness – a crucial driver of long-term prosperity. British politicians and the public, understandably, like some parts of the EU and not others. But in the Brexit negotiations, we won’t be allowed to cherry-pick the bits we like and reject the rest. That realisation, which may only dawn slowly, will have significant economic and political ramifications, for years to come.